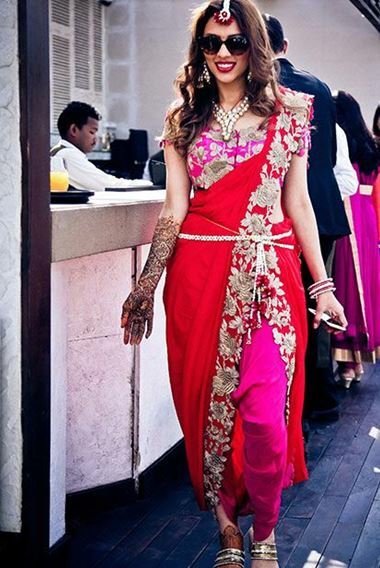 If you want to dress up for a party or any traditional gathering, then a saree will be the best choice. Just like our culture, saree has also evolved as a perfect garment for all sorts of parties and events. Gone are the days when saree was seen only as a traditional garment. The different styles and variants of sareehave made it the most versatile garment in the recent times. Every actress in Bollywood loves to don saree for movie promotions or other events. Take for example, Sonam Kapoor, who has made appearance in saree most of the times for Bollywood parties as well as red carpet looks. Not to mention, VidyaBalan or Rekha, who love to wear kanjivaram sarees for the award functions. 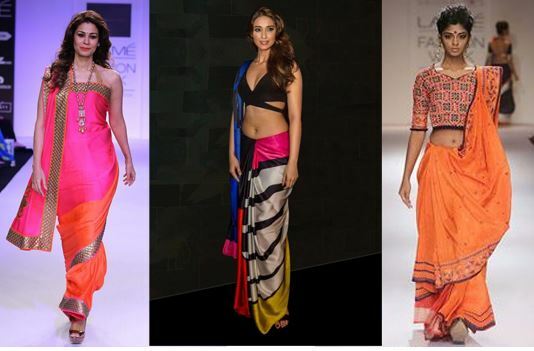 In fact, our Bollywood divas have made many appearances in saree for red carpet looks abroad. Do you remember the hit song “Aajkaltere mere pyarke” from film Brahamchari? Everyone loved Mumtazin the song. More than that, her saree draping style became such a rage. 2016 is the new retro. Every retro trend is making a comeback so Mumtaz style drape will be the best to wear to a party and look like a diva. Start with the basic saree draping step where you start making the pleats of the lower drape. But don’t tuck it in the center of petticoat yet. Make pleats of 5-6 inches of the rest of the saree and then bring it across the front from the left shoulder by taking it under the right armhole and secure with pins. Inverted drape style became a major hit after Deepika flaunted it in YehJawani Hai Deewaniwith a blue saree. Hence the name Deepika style saree. This saree also takes cues from retro drape style but gives you an edgy look for the party. You won’t need many accessories to style it up and it will highlight your curves perfectly. Adjust the border on the front side so that it looks like two lines meeting until the left shoulder point. Pin it there and keep it in place. Pant style or dhoti style drape has been highlighted by Sonam Kapoor and that has become a mainstream fashion trend in saree. This is a perfect draping style to stand out in any party. Especially if you love to try fusion dressing, then this is the best drape to experiment with and is super quick to make. This Gujrati-fusion style drape is the new ‘it’ thing in saree. This style has been increasingly appearing in most of the runway fashion walks. But you can add a little twist to it and make it more appealing and party-appropriate. Now pick the first border edge of the saree under the left armhole and pull it across your left side. Tuck it to the left side of your waist.